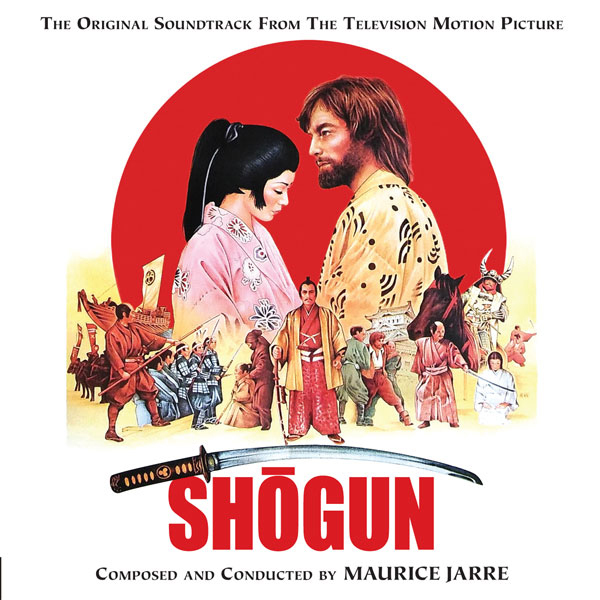 Intrada presents a 3-CD set encompassing Maurice Jarre's massive work for the 9-hour miniseries Shōgun (1980). In 2008, Intrada re-issued the original RSO LP program on CD, which featured 37 minutes of highlights, focusing on the more exotic aspects of the score. Much of the larger, orchestral score was not included. All three discs are newly mixed from first generation 2˝ 16-track multitracks, allowing the listener to hear a level of detail and crispness simply not present on the original LP master. In order to showcase Jarre’s expansive score in a coherent and musically balanced fashion, CD 1 presents Parts I and II with some abridgments. CD 2 is devoted to Parts III, IV and V, with minor trims. Many of the cues wound up edited and reused across multiple parts, but they are presented here in their original slated order. The final series mix added wild overlays to certain cues; these have been left as Jarre originally wrote them. CD 3 recreates the 1980 RSO album assembly—including alternate takes and some novel edits and cue combinations— followed by a selection of bumpers, alternates, source music, and all the cues that were abridged from the main program. Both epic and international, Shōgun was from the very beginning a project crying out for Maurice Jarre’s particular blend of talents. Jarre specialized in percussion, and that is never more apparent than on this score. The role of music in Shōgun was made even more important as a consequence of Clavell’s decision to shoot the film mostly in Japanese, without subtitles and only with sparse narration. Furthermore, the exotic setting and clash of cultures had to be convincingly and authentically addressed. Jarre’s main theme features both a swashbuckling setting for uptempo action sequences as well as a romantic theme assuming a gentler, more yearning persona. In stark contrast to the romance and adventure is some powerful music featuring Japanese instruments mixed with orchestra, giving a weighty presence to the feuding warlords. It's all here musically - 17th Century Japan with clashing cultures and feuding warlords. Loosely inspired by the life of Will Adams (fictionalized as John Blackthorne), the story tells of an English shipbuilder who sailed to “the Japans” at the dawn of the 17th Century and became a samurai. Shōgun, written by James Clavell and third in his Asian saga, was one of the most successful novels of 1975. Producers were daunted by the scope it would take to film the extensive story, but with the proven success of the miniseries Roots in 1977, they found the confidence to proceed and thus was born the age of the miniseries. Starring Richard Chamberlain in the title role, Shōgun proved a hit with viewers.